(Seychelles News Agency) - The majority of South Africans born post-apartheid on Thursday said restoration of business in the mining industry must be a key priority of a political party that will win the country’s general election. 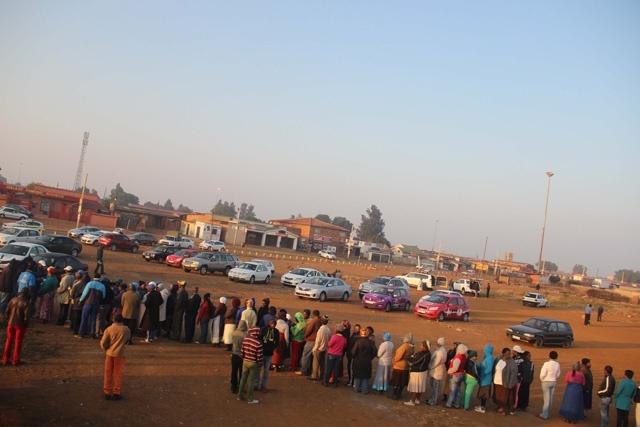 Yesterday, South Africa went to the polls to elect a new national assembly and provincial legislatures. Vote counting is still underway. The need for a better life and brighter future pushed us to the polls, a Business Management student at the University of Johannesburg told SNA. “Peace in the mining sector should be the starting point to restore investor confidence in South Africa to ensure economic growth and job creation,” said 21-year-old Mbila Lwamonde. In an interview, South Africa’s top researcher and economist Dr. Oren Dayan said platinum companies in South Africa are at risk of losing thousands of jobs as more mines operate at a loss during to unrest in the industry. The born frees say political leaders must uphold to their sacrifice to dismantle hash apartheid regime by fulfilling their election campaign promises. “All (parties) promised jobs, better education and service delivery. All this to us meant better tomorrow for the nation,” another first time voter Mulalo Zwanga noted. “Dealing will labour violence and strikes in the mining industry should be the first priority of the next government to ensure deliverables,” he added. “My vote goes by saying politicizing the mining sector must end. I am saying, stabilize mines for our better life and future,” Lwamonde said. “This is where we are missing it. Mining has potential to create jobs for many the educated and uneducated but politicians a busy using mines as political playing ground,” 22 year old Kingdom Singo. According to figures released by the SA Institute of Race Relations (SAIRR), South Africa’s mining industry lost more than 1.5 billion US dollars in production during the strikes in the 2012/2013 financial year. South Africa’s first time voters say they want better service delivery in the form employment creation, better education for all, better houses in the slum settlements, easy access to water and electricity for all citizens- the poor and the disadvantaged. “All I am looking for is that the party that will win must deliver to its promises. They all know what they told us. We will be watching,” said 20 year old Funanani Masango. Local social analyst Worship Munhangu said after the election process all political parties- winners and losers must work together to stabilize the economy and local markets. “For this to happen we all have to go back to the Mandela legacy of a peaceful and prosperous South Africa built upon united citizens,” said Munhangu.